Pictured above from left to right, K&J's Don Ihler, Jan Ihler (Don's wife), Sarah Hoffman (Bob's wife), and K&J's Bob Hoffman. When Bob Hoffman decided to go to the National Truck Driving Championship he knew it would be a hard competition. He also knew that there were some big names in trucking that were bringing the best of the best; truckers who had trained professionally all year for tasks like those at the NTDC. But he was prepared to show that a little Sioux Falls trucking company can give the big boys a run for their money. And he did just that. 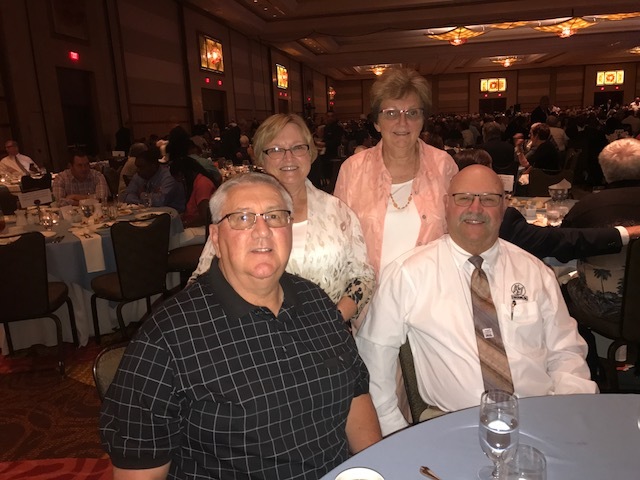 K&J driver, Bob Hoffman has been at the National Truck Driving Championships 7 times since 2004, and this is his fourth time competing for K&J Trucking. Before you write that off, consider that there are only 8 competitors chosen from each state! And did we mention that he is 67 years old? While he is away at nationals we thought it would be fun to overview what it is like competing in the national championship!